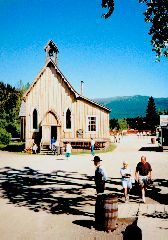 Once the largest city north of San Francisco and west of Chicago, Barkerville is one of BC's oldest historic sites, recognized for it's impressive collection of original and restored buildings and artifacts. Barkerville rose from the Cariboo Goldfield's during the 1860's, but in 1868 the prosperous town was destroyed by fire. A second Barkerville was built but by 1871 it was obvious that growth had peaked. 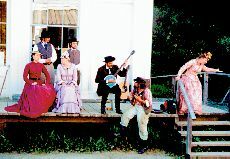 By 1900 Barkerville held only a vestige of its former glory. 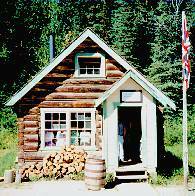 The Provincial Government decided to restore Barkerville in 1957 as its major project for the 1958 Centennial. Each year, thousands of visitors from all over the world travel to the foothills of the Cariboo mountains to take in this one of a kind heritage attraction, much like miners and prospectors did during the original gold rushes. 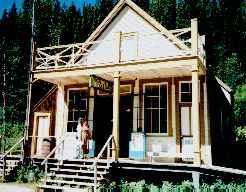 Barkerville Historic Town is located 89 kilometres east of Quesnel on Highway 26. Kelly & King House and the St. George Hotel offer visitor lodging. Three campgrounds, with paved access, located close to Barkerville Historic Town, accommodates tents, RVs, campers and horses. Pets welcome! Scenic views, mountain creeks, walking and biking trails. Dry firewood for your campfire. One bundle is $5. Located just 3 km from Barkerville, on Bowron Lake Rd, 54 campsites with a group picnic shelter, horse paddock rentals, coin-operated showers and flush toilets. Pull-through spots are available. This site is wheelchair accessible. Horse-friendly! Governmental Hill has 23 campsites, and is located within walking distance of historic Barkerville. Features include fire rings, picnic tables, pit toilets. Not suitable for large RVs or long units. For more information or reservations, contact the campground directly. Reservations require a deposit. You can tour the town with one of the colourful characters from Barkervilles past, watch the notorious Judge Begbie strike fear into the hearts of historys criminals, witness authentic gold rush theatre, and see a real Cornish Waterwheel in action. Pan for gold with your family and friends, visit Barkervilles well preserved Chinatown, and go back to school in the 1800s. Or, learn about the town at your own pace by visiting our historic buildings and beautiful displays. The town's merchants, restaurants and accommodations will provide you with everything you need for a genuinely comfortable trip into the province's past.